Among the tourist traps of Covent Garden and Leicester Square, Long Acre stands out for its affordable pints, good cocktails and the clientele’s (relative) lack of London maps, khakis and cameras. It fills up pretty quickly on the weekends, and plays decent music. We managed to find a booth at 8pm on a Friday, and settled in with a few pints. 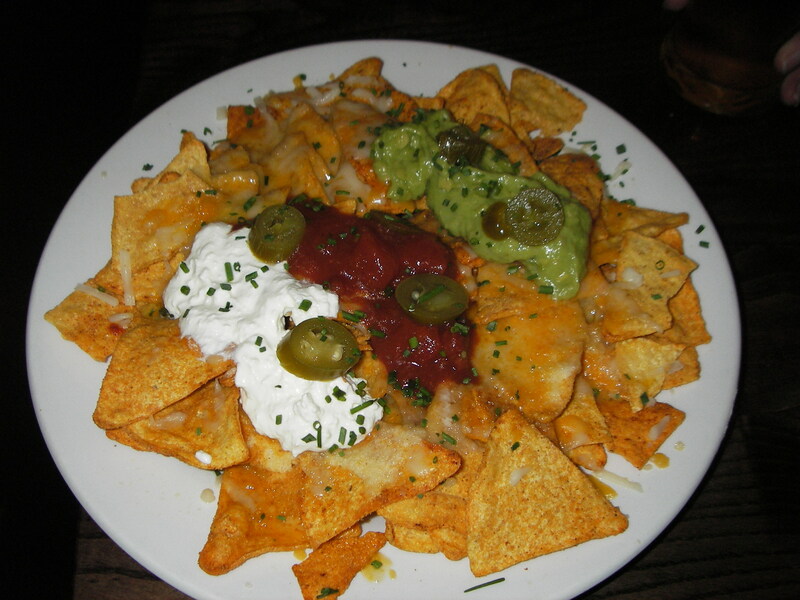 The menu description did not inspire confidence; Long Acre describes its nachos as “smothered with melted cheese, jalapeños, spicy tomato salsa, guacamole, sour cream and chive.” Is there any other kind of salsa besides the spicy kind made with tomatoes? And it’s “chiveS.” Still, onward we go, bypassing the smoked salmon crostini with créme fraîche and roast mini-cumberland sausages. Appearance: (7) At first glance, these nachos appeared promising: guacamole, salsa, sour cream, melted cheese, even chives sprinkled over the top. Closer inspection revealed something peculiar about the tortilla chips: they were actually Doritos. If this were a conscious experiment we might give Long Acre some points for creativity, but that seems doubtful. “Odd” is the best way to describe the Dorito-nachos. Distribution: (4) There was enough salsa, guacamole and sour cream, but the cheese only existed on the top layer. The plate became progressively less nachos and more “super-bowl-chips-and-dip” as we finished off the top layer of chips. The cheese quickly cooled and coagulated, forming blocks of Doritos. Price: (7) 4.50 GBP / $7.35: For the portion size, this is the best value we’ve seen in downtown London. There’s a long way to go in terms of quality, though; we’d recommend starting with better sour cream, cheese distribution and meat. Oh, and actual tortilla chips. Overall: (22/40) We’re long on the bar, but definitely short on the nachos.